I'm in the process of packing up my study. (Oh dear, just typing those very words makes me want to go and lie down.) I'm having the room redecorated because it has got to the point where the wallpaper is beginning to come away from the ceiling. Wallpaper? Ceiling? Shows how long it is since it has been decorated properly. The kids and I use the study as a second living room, and we spend quite a lot of time in there, so it seems silly not to have it looking nice. I also want to de-office it, so all the metal bins and desk accessories and so on are going out and instead I'm going to have rattan baskets and warm textures and colours. It's the only room in the house that's never been professionally decorated, mainly because it is full of books and my computer. The thought of being without those (oh, dear, I think I want to go and lie down again) has always put me off clearing it out. But the moment has now come. 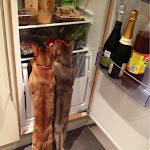 Or rather, the decorators will come, on Monday morning. I feel a bit guilty about this, because no sooner did I start packing the books up than I realised there were several that I had been meaning to write about. So if you'll forgive me, I'm going to do a very quick, one-minute review of each. I don't know any gardener who hasn't got a bit of dry shade somewhere in their plot. It's one of the most common, and one of the trickiest, problems to solve. As Graham says in the piece that he wrote for The Independent Magazine, "it's the patch of dark and dusty soil that reminds you perhaps you're not quite as good a gardener as you'd like to be." Graham is editor-in-chief of the Royal Horticultural Society's Encyclopedia of Perennials, and an RHS judge, so he knows his stuff. But the book is written in a very easy and relaxed style - much like Graham himself, in fact! The result is a how-to manual, that fills you with have-a-go inspiration. 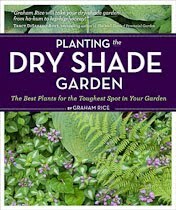 Graham offers various solutions for dealing with drought and lack of light and of course offers planting suggestions. too. This isn't just a list - there is a page for each plant, each lavishly illustrated with photographs by Graham and his wife, Judy White. Like the next book, this one has, in my opinion, a slightly misleading title. It's a beautiful book, with gorgeous colour photographs, by one of Britain's leading experts on grasses. However, the emphasis is very much on the grasses themselves, and not so much on designing. Neil Lucas, for whom I have huge admiration, might find that a rather nit-picking criticism, because there are lots of planting suggestions. There's a section on grasses for shade, for example, and one on year-round interest. It would have been nice, however, to have a couple of sample border plans or container recipes that people could try out in their own gardens, especially if they were new to growing grasses. 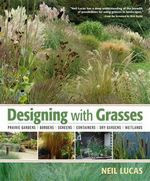 Having said all that, this is a must for anyone who wants to plant any grasses anywhere. Published in January, it is already well on the way to becoming one of those classics that you find on every serious gardener's bookshelf - and deservedly so. 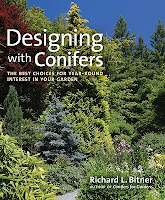 This book is by an American author and is really aimed at an American audience, but conifers are so unfashionable here in the UK, it is difficult to find a book that takes them seriously. I love them, for their variety, their year-round interest and their texture, so I was anxious to get my hands on this volume, which - like the previous two books - is published by Timber Press. 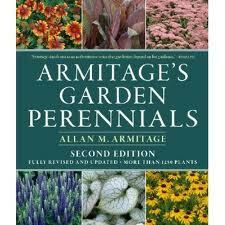 The author studied horticulture at Longwood Gardens in Pennsylvania, which I visited some years ago. 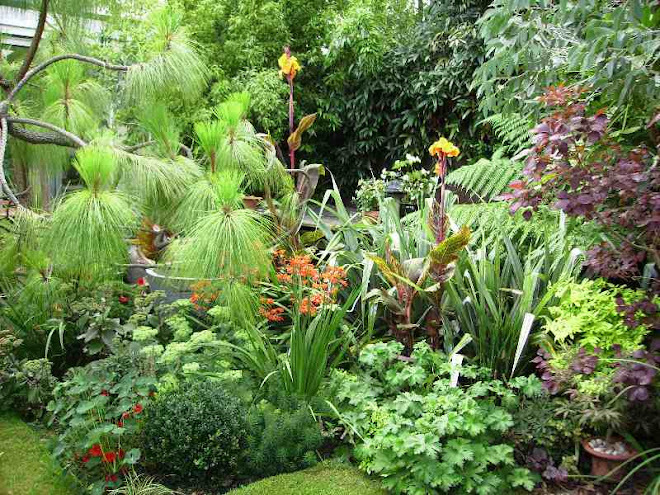 But while there are photographs of very grand conifers in very grand gardens, like Longwood, there are also examples of suburban gardens and even containers. There are no planting plans, as such, but there is a case study garden -Cassandra and Bryan Barrett's amazing conifer garden in Eugene, Oregon - showing how the various layers of planting work with each other in terms of height and shape. 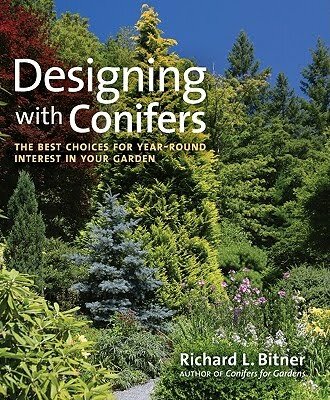 One of my favourite chapters was on Railway Gardens, showing how dwarf conifers in particular can be used to great effect in creating miniature landscapes for model railways. I suspect Mr Bitner has a bit of a weakness for such things! Another North American book, also by Timber Press. When it arrived in the post, I stuck it on a shelf, thinking: "Guide to perennials, yeah, yeah" and left it there for a few days. I eventually opened it to look up the section on sedums, and was completely charmed by this opening sentence. "I love the sedums for their amazing diversity of foliage, flower and plant habit, but there are so darn many of them, it is impossible to grow or know them all." This is a guide to perennials with attitude. Here in the UK, we tend to take our gardening books rather seriously - a colleague was genuinely shocked when Graham Rice, writing for The Independent, described himself has having "grown a huge number of plants while searching for those to include in his book (see above) and killed many of them in the process". So it's very refreshing to hear Allan Armitage say, on the subject of achillea: "Yarrow is used for making beer ... Having tasted some of the concoctions of my beer-making friends, no ingredient in homebrew surprises me!" Or, recommending Rudbeckia 'Henry Eilers': "Find it, buy it. Full sun." I should declare an interest here. 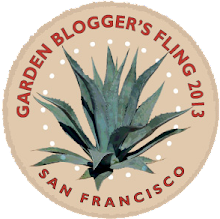 I know Cleve, and I'm a great fan - not only of his garden designs, but also of his writing. 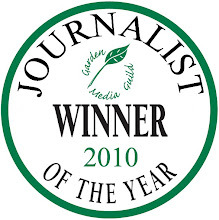 In 2002, when I was editor of The Independent Magazine, I hired him to write our Urban Gardener column, which ran for five years. He often wrote about his allotment during that time, but even so, I was intrigued by the idea of a book. Would it be a "year in the life of my allotment" tome, or a "how to grow your own" manual? In fact, it is as close as you can get to wandering around the allotment with Cleve himself, one minute talking about wildlife, the next talking about his fellow allotmenteers, interspersed with lots of sensible observations. "If you are new to gardening," he warns the novice veg grower, "the best way to injure yourself and dampen your enthusiasm is to go at it hammer and tongs from day one ... Little and often is best." It's a fascinating glimpse of allotment life - but it's also a fascinating insight into Cleve himself. Perhaps the final word should go to my mum, who to my knowledge has never ever read a gardening book. She picked up my copy of Our Plot, flicked through it and said: "This looks really interesting." Gotta go pack up those books now.